Car accidents are no fun, and when you are involved in one, it can be one of the scariest moments of your life. But when we see them in movies, they are a feast for the eyes and often lots of fun to watch–even if they are not always realistic. In honor of this great action movie tradition then, we have put together a list of nine of the greatest car crashes in movie history. After all, what kind of a movie car chase doesn’t end in a great crash? Read on and find out which ones made the cut. Warning: some of the clips below are not for sensitive ears or eyes, as they may include graphic scenes. As far as big action blockbusters go, The Dark Knight takes some beating. One of the most memorable scenes involves a road chase between Batman on a motorcycle, and the Joker in a semi. It culminates in an epic flip of the Joker’s truck. If we are talking about crashing semis however, it is impossible not to mention the famous crash in Terminator 2, which involves a tanker carrying liquid nitrogen and a steel mill. It occurs as the climax of a tense car chase in which the T-1000 chases down John Connor and the original Terminator. No one could forget the sight of the T-1000 emerging out of the clouds of nitrogen. Who hasn’t fantasized at least once about a giant police car pile-up? Well, that fantasy became (almost) reality in the 1980 classic, The Blues Brothers. Any car crash is bad, but when fate steps in, you can expect much worse. The premonition at the beginning of the second final destination movie is as as gruesome as it is ridiculous. It has everything–logs rolling off of semis, a water bottle rolling under a brake pedal, and explosions galore. The best car crash scenes start with a good car chase. The Bourne Ultimatum accomplishes both of these things with aplomb. Quite how Bourne survived the final crash is a bit of a mystery, but we’ll have to put it down to his superhuman abilities. Ghost Protocol is perhaps the best of the Mission Impossible sequels, and breathed new life into the franchise. There were many memorable stunts in the film, but one particularly memorable chase took place in a Dubai sandstorm, culminating in an intentional collision on a bridge, after which Ethan Hunt is almost crushed by his car. Not the kind of movie that you usually associate with car crashes, and while this one is not a collision with another vehicle, there are few more memorable scenes than the one in which we see Cameron’s father’s beloved Ferrari career off of its blocks and through the glass. If you are a car lover, you might want to look away as James Bond flips his Aston Martin a record nine times. 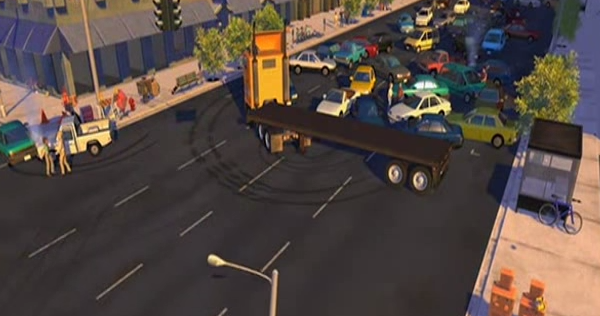 To end on a lighter note, we will turn to Pixar and one of the funnier car crashes you might ever see, in Toy Story 2. Did we miss any great movie car crashes? Let us know on Facebook.